Deforestation is one of the main causes of environmental degradation in Uganda and high on the list of priorities of our partners. Forest cover is just 0.3% in Kamuli and even less in Ngora, compared with 14% in Wales. 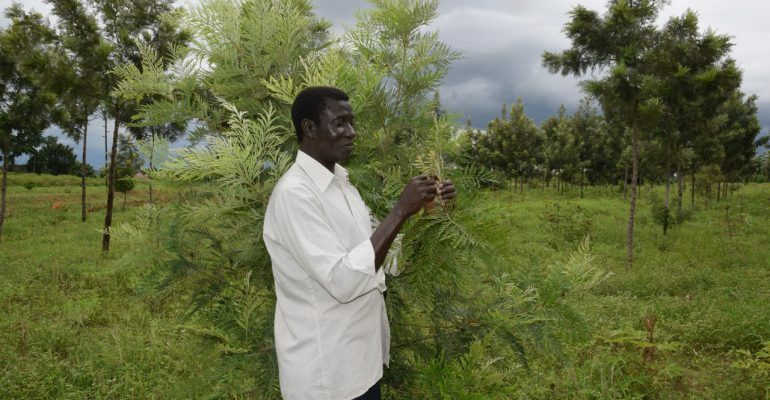 We are supporting agro-forestry projects in both areas, which are making excellent progress. 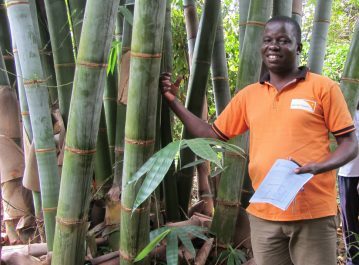 The Dolen Ffermio Environmental Farming and Health Organisation (DFEFO) in Kamuli has 400 members at 10 regional centres. Members of the environmental team, headed by Moses Kitimbo travel to each centre at weekends to provide training in organic tree management and medicinal use of trees. 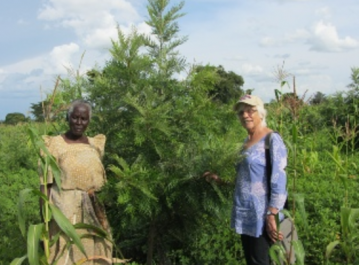 Since the start of the project in 2012, mango, orange, jack fruit and Grevillea timber seedlings have been distributed to members and are mostly thriving. 600 orange seedlings have already been planted and there are existing coffee and banana plantings. A very exciting development is the recent acquisition of 34 acres of land north of Kamuli and beside the River Nile, thanks to two generous donations. 600 orange seedlings have already been planted and there are existing coffee and banana plantings. The land will provide a wide variety of seedlings for the community projects and for sale to generate income, as well as demonstration timber plantations and fruit orchards. We are now raising funds to fence the land and, in time it will also become a demonstration farm for all agro-forestry, livestock and crop systems. In May 2016 Steve Jones and his UK team ran a Permaculture workshop for the DFEFO team. The Nakyaka land was used for the study, surveyed and many ideas projected. Immediate priorities were identified including digging 5 swales across the land to retain water as it moves down to the river. The study revealed an urgent need for a tree nursery for timber: Musezi, Mavule. Eucalyptus, and medicinal and fruit trees. The tree nursery beside the Goat Unit benefits from the security and the water supply it provides. 6 nursery beds and 2 potting houses have been built by the local community and Grevillea timber tree seedlings have been distributed at the rate of 150 to 200 per household. Phase 2 of the project is now under way with the planting of lemon seeds to provide the rootstock to bud orange varieties, together with mango seedlings. Many of the phase 1 timber trees, planted in April 2013, have grown up to 10 feet high and are thriving.